Following an impressive program, with Senators and Congressmen as guests, and local and State historians (including past St. Mary’s student Steve Spilos) as speakers, plus renaissance and baroque music by a brass quarter, a reception was held in St. Mary’s Community Center. This was also the month in which Cardinal Dearden retired, but he stayed on to assist his successor, the Most Reverend Edmund Szoka. Archbishop Szoka distinguished himself by initiating the Catholic Services Appeal – a door-to-door fund-raising effort that netted cash and pledges in excess of $9 million, which was half-again as much as the original goal. Considering the economic depression being suffered nationwide, but especially in auto manufacturing areas, this was monumental achievement. Detroit’s good people had come through again. And a third of the fund was pledged to inner-city parishes and schools. 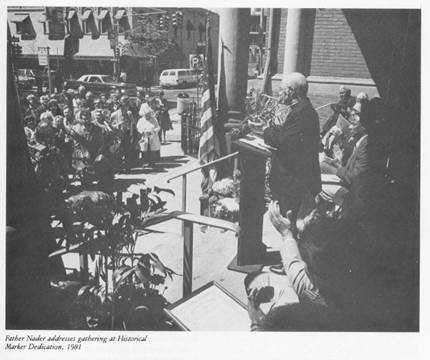 In October 1982, the School Sisters of Notre Dame marked the opening celebration of the 150th anniversary of their founding with special liturgies and services in their local, provincial, and international groups. In the Detroit Archdiocese, the Sisters marked the occasion with a prayer service, film, and dinner at St. Mary’s Parish. The original congregation of Notre Dame was founded near the close of the 16th century at Mattaincourt, in the French province of Lorraine by St. Peter Fourier, regular canon of the Order of St. Augustine. He was born November 30, 1565, and died December 9, 1640. The first Mother Superior, Alix LeClerc, and four companions began their religious life together on Christmas night, 1597, but the constitutions of the congregation were not formally approved by the Holy See until 1628. The order then spread rapidly throughout France, Germany, and Savoy, but during the French Revolution and the devastation following it, those houses were suppressed, followed by those in Bavaria. The last to be confiscated was at Stadtamhof. In 1833, the order was reestablished by Caroline Gerhardinger, a virtuous and highly gifted young lady from Stadtamhof who had been a student of the previous order when their convent was confiscated in 1809. She would later be known as Venerable Mother Mary Teresa of Jesus, laboring under the guidance and direction of the sainted Bishop George Michael Willmann, Bishop of Ratisbon, and the holy priest, Francis Sebastian Job of Neumburg. The purpose of the foundation was the instruction and training of youth. Father Job’s native place, Neumburg vorm Wald, was chosen as the site of the first little convent, which was dedicated on October 24, 1833. In 1839, at the request of King Louis I of Bavaria, the Motherhouse was transferred to the Au in Munich, and in 1843 the confiscated convent of the Poor Clares was officially presented to the order. After twenty years of labor, attended with signal blessings, the religious institute “Poor School Sisters of Notre Dame” obtained the sanction of His Holiness, Pius IX, in January 1853. During the years between 1835 and 1840, the flood of German emigration to America reached its height. Thousands of Catholics flocked to the New World where they then found themselves in straitened circumstances. Nearly all of them were poor. Some sought to build homes in primeval forests. Others tried to find accustomed work in the factories of the large cities. They were greatly in need of religious care. A priest speaking the German language was seldom met. Many a German priest, compelled to return to his native country to collect for his poor mission, visited Mother Teresa and besought her aid, but none of them could guarantee a home for the Sisters, which would be very much needed. A certain Baron von Schroeder made an offer to the Archbishop for the Sisters if they would undertake to teach the schools in St. Mary’s, Pennsylvania. He submitted a written statement from the American Bishop, testifying his willingness to receive teaching communities into his diocese. The Archbishop of Munich advised Mother Teresa to accept the mission and from the funds of the Mission Society offered her the money necessary for the traveling expenses and also for the erection of a house. Without much hesitation, Mother Teresa declared herself willing to make a trial at least. King Louis rejoiced that the Order, whose beginning and development he had watched and protected with so much care, should enter upon missionary work in a distant land. On June 25, Mother Teresa and her spiritual daughters, Sisters Barbara, Magdalen, Seraphine, Caroline, and Emmanuel, boarded the “Washington” and were on their way to America. It was a rough voyage. Mother Teresa became very ill. On the feast of St. Ignatius, July 31, the sisters landed in New York. The novice Sister Emmanuel was taken ill on the way to St. Mary’s and died at Harrisburg, where she was buried. Mother Teresa went to Baltimore with two of the Sisters, while the other two stayed at St. Mary’s to tend to the school there. In Baltimore, In October 1847, the Sisters moved into their newly acquired home. The following March 11 more Sisters arrived to help. Early in April 1848, Mother Teresa and Sister Caroline set out on a long journey to visit places from which proposals had come for establishing branch houses. They had as their guide and protector on this journey, Father Neumann, who, as Bishop of Philadelphia, was soon to become a man of Providence for the growing congregation. The Congregation is happy that he was proclaimed as Saint in June of 1977. They went first to Pittsburgh and called on Bishop O’Connor. He promised to hasten the necessary preparations for the opening of St. Philomena’s School in that city. The zealous bishop was please to learn that more Sisters had come to assist in the work of the schools and that the Reverend Father Neumann had promised to entrust the schools in the Redemptorists’ parishes throughout the country to the School Sisters of Notre Dame, who would open five of the within the next few months. Encourage by the words of the Bishop, the travelers set out for Detroit, where they learned the conditions of St. Mary’s parish. Here they were asked to accept the school and orphanage, but circumstances were such that the date of acceptance had to be postponed. A third missionary band of ten Sisters arrived to relieve and assist in the several foundations, January 28, 1849. The first profession of vows made by the School Sisters in this country was held August 15, 1849. On that same day, Sister Caroline took her Perpetual Vows. 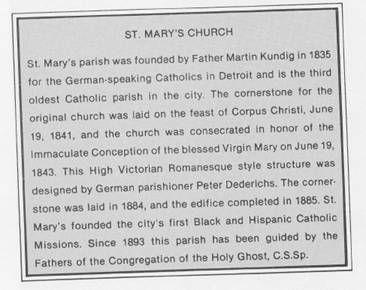 At the request of the Redemptorist Fathers, the Congregation took charge of St. Mary’s School and an orphanage for girls at Detroit on September 24, 1852. The number of orphans was small and remained so for years. The number of parochial school pupils increased so rapidly that the Reverend Fathers were obliged to find homes for the orphans among the families of their parishioners, and the orphanage was used for classrooms for the parish pupils. God blessed these humble beginnings of hardship and toil. The Milwaukee Mother house was founded in 1850, and Sister Caroline was appointed the first Mother Superior of the School Sisters in America. The congregation grew rapidly. In 1958, the Milwaukee Fire Department and Building Inspectors said that the old Motherhouse was a fire trap. They wanted many improvements made, which would cost well over $1,000,000 and then would still be an old building. The neighborhood, too, was getting very bad. So the Sister purchased a large farm in Mequon, Wisconsin, with one-half-mile of lake frontage. Here a modern Motherhouse was built, and the Sisters move there in 1959. The Province is now called Mequon Province. The main International Motherhouse for all the School Sisters is Rome, Italy. The Mother General of the congregation resides there and periodically she or her assistants visit some of the houses of the congregation. The Rome Motherhouse was established in 1957. The Congregation today has 21 Provinces throughout the world. In the United States the Sisters work in 35 of the 50 States.